Analogman carries the Boss SD-1/808 - We now sell new Boss SD-1/808 pedals due to popular demand. These are brand new Boss pedals in the original box with manuals, with our various mods. We now sell new Boss SD-1/808 pedals due to popular demand. These are brand new Boss pedals in the original box with manuals, with our various mods. Boss raised the price by $10 in late 2004, but we bought many cases of them so we could get the old price and not have to raise our prices. Boss changed these to SMT (surface mount) construction in 2018 or so, but we have a bunch of the good ones still in stock. If you send one in for a mod, make sure it's the old style, the circuit board fills up the whole pedal on the old ones. We modify the Boss SD-1 Super Overdrive to basically Ibanez TS-808 specs, including the chip. This is the yellow pedal, not the orange DS-1 Distortion. 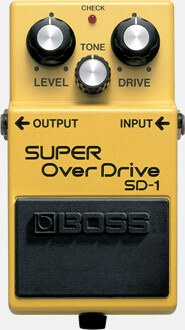 The yellow SD-1 has the same basic design as a Tube screamer but with asymmetrical clipping. I can leave the clipping as-is (Boss style asymmetrical clipping) if you wish, but I normally change it to the Ibanez (symmetrical) style on my standard SD-1/808 mod. Ibanez told me that Roland (Boss) has a patent on asymmetrical clipping, which gives it a bit more volume, harmonics, and crunch. With Ibanez style clipping, it sounds very much like a TS-808, but still has a touch more edge and drive available. With Boss style, it gets yet a bit more volume, edge, and harmonics. The Brown option is standard on the SD-1 as it really helps to smooth out the sound. We can change the LEVEL pot to a PUSH PULL POT in order to switch from stock asymmetrical clipping to Ibanez style symmetrical clipping. This is a $25 additional option at time or pedal or mod order, or $40 to later add just the push pull pot to a pedal. When PULLED OUT, you will get the louder, crunchier Boss asymmetrical clipping. Instead of the push/pull pot, we can mount a mini TOGGLE switch to select the clipping. It's the same price and may be harder to accidentally change the setting on. Be sure to check out the sound clips of the Boss vs Ibanez mode in the Sound Samples area from The OD Pedal Comparinator. Several years ago a customer pointed out to me that he could hear a fuzzy buzzy sound in the background when his SD1/808 pedal was OFF with the DRIVE knob was up all the way. Listening carefully, I was able to confirm this, though I and thousands of other people had not noticed it before. It can be heard on any SD1 pedal, the mod did not affect it. We found a way to kill the "bleed through" on one of the DIY EFFECTS websites, but it was messy, consisting of tacking a FET and other components onto the board. It is too messy and possibly unreliable so we did not do this bleed fix unless we got a customer complaint (only about twice out of about 1000 SD1 pedals sold). In 2007 we got an email from Claus Holm Jensen from pedalsite.dk who told us he found a simple fix for this problem. I tested it out and it was perfect! I studied the schematic and layout and found a way to do it even easier, by moving just one component and one wire, and it seems to work just fine. Also it is a very reliable mod as there are no parts floating off the board. So we will now (October 2007 and later) do this "bleed fix" mod to all SD1 pedals that come in for mods or repair. If we have previously modified your SD1 and you are annoyed with the bleed through, we can do this mod for you for $10 plus S & H.
I have spent weeks of research changing nearly every component on the SD-1 and have found the ones that really make it sound better- like pulling a blanket off the speaker cabinet! The SD-1/808 mods are the same price as TS9 mods even though there is much more work involved in the modification and more parts to change. Some people really like Boss pedals, and they have much better switches than the TS9, so this is a great choice and cheaper than a TS-9/808 if you want a good smooth overdrive. Also the SD-1 seems to have a bit more low end after the mod. Our SD-1 mod improves the tone and low end even when OFF, as we change two capacitors that are sucking tone and low end when the pedal is ON or OFF. The silver mod improves the bypass tone even more, we now put in New Old Stock TS-808 switching FETS to clean up the bypassed sound. Beware modified SD1s on ebay claiming to have Analog Man Mods but done by someone else. From looking at the pictures, they seem to have the very 1st version of our mod from several years ago. This mod does not sound so good, and has popped up in a DIY diagram on the internet which is in color and says "SD-808" on it. I play jazz. I dont typically use heavy distortion though I use a clean boost to improvise over loops. Already use the DS 1 pro mod which is all I need. Still during a recent pedal search I tried the SD1 stock & liked it... for solo looping. With a group it did not have the headroom & would clip. Still had potential. Instead of doing the silver I did the 808 vintage mod. Thought it'd be nice to have a boost that's more airy and "watery". I opted for symmetrical clipping so its smoother than the stock SD 1. I like it. I have it paired up with the DS 1 pro mod (think Jeminie Distortion). Essentially the way I have them, they're very similar though I like having two options for lead boosts. Maybe one day I'll rock it with the silver mod though for now, I like it. Thank you, AM. Edit: had to to give this rascal all five stars. Amazing how an already nice sounding SD-1 sounds with the 808 mod. Brilliant. I had Mike do his Silver mod on my SD1 about 15 years ago and that exact pedal still remains my go to for every gig I do whether it be with Norah Jones, Bob Weir or Daniel Johnston. I now own 3 of them (as well as a Silver TS9) and couldn't be more happy with how naturally musical the tone is that they provide. By using the gain knob you can go from an almost transparent boost to a fairly heavy overdrive without losing any of your picking nuances. On top of that, Mike provides extremely quick and friendly customer service. You can tell that he really is proud of his work and will do his best to make you proud of your tone! I recently bought the sd-1/808 silver mod. If you're looking for a tubescreamer with a crispy clean bass and singing highs this is the pedal. I was always a huge fan of tubescreamer but I found them sometime way to gritty and dark sounding. IMO the sd-1 is a hybrid between a ts-808 and a bd-2(the modded ones) I mainly use this pedal as a clean boost( I like boosts with some bottom end) or as my main gain channel. When using the pedal as gain channel is boost it with my mxr dyna comp with high output an little compression. the lead sound is smooth, transparent and rocking. Full chords still sound clear to me. This is an unbelieveable sounding pedal. I run it as a clean boost, as my rig is already dirty enough w/a maxed out old 70s Marshall head, through 4 x 12 Celestion 90s. I run this into a Beano boost, to get my Blackmore tones. I also have an old Analogman Arbiter Fuzz Face w/Germanium transistor, for my Clapton Cream sounds. Analogman just makes the pedals sound great. Anytime I get tired of my sounds, I look to see what else Mike has cooking.